Antxon López Usoz, President of AFM, Advanced Manufacturing Technologies: “We confront this new Machine Tool Biennial with the best expectations since the crisis began. We have made an enormous effort to show the machines, components, tools and accessories that are going to increase our customers’ productivity. Although these are still very early stages, we have noticed a certain reactivation of the local market, so we hope that everyone related to industry and advanced manufacturing will come to Bilbao to see our novelties and discover the means that will enable them to produce better, faster and at a lower cost”. Starting on the 2nd of June and continuing throughout the week, 65 of AFM’s member companies will convert the BEC exhibition centre into their best showcase. The Spanish machine tool sector is the third producer and exporter of the European Union and ninth in the world. In 2013, it increased its turnover by 6.4%, reaching 1,412.11 million Euros. This growth has been due mainly to a consolidated activity portfolio, whose delivery became effective in 2013. Furthermore, the sector broke its own export record again this year, reaching 1,178.2 million Euros. This accounts for an 8.3% increase in exports with respect to the previous year. The first five destinations for exports were: Germany, China, France, Mexico and Brazil. During the presentation of the fair, the President of the sectoral Association of manufacturers insisted on the importance of having a strongly developed industry that receives solid support from all public and private entities, in order to guarantee a more sustainable and more stable future for society as a whole. He defended industry as the main driving force for progress and well-being. 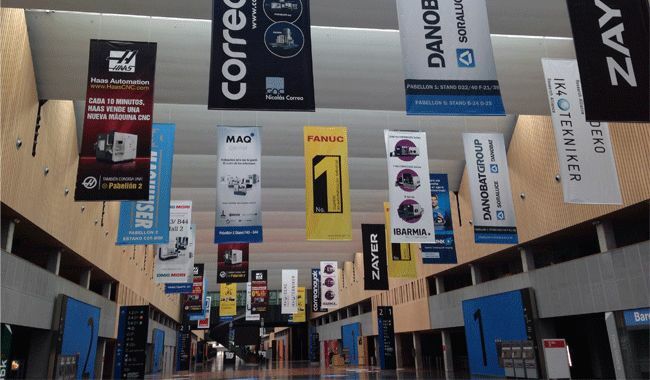 The Biennial, with 1,314 exhibiting companies from 27 countries, fully occupying four pavilions, is the most important industrial show to be held in Spain. Special solutions can be found for machining parts for such outstanding sectors as the automobile, aeronautics, iron and steel, rail or capital goods sectors. On 2 June, the Lehendakari, Íñigo Urkullu, will preside the opening of the 28th BIEMH, accompanied by several institutional personalities, as well as by the President of AFM, Antxon López Usoz. 6,500 technical students and 500 teachers will attend: throughout the entire week, a team from AFM-BEC will present the sector to them before they visit the fair. The result of the 11th National Machine Tool Design and Innovation Award will be decided on the 4th of June. The Regional Minister for Innovation of the Regional Council of the Basque Country, Imanol Pradales, will preside the awards presentation ceremony. A special exhibition area has been reserved in pavilion 5 for two emerging technologies: additive manufacturing-3D and composites. Presentations will be given throughout the week. On the occasion of the Machine Tool centenary in Elgoibar and coinciding with the BIEMH, the Elgoibar Town Council has published a book about the history of the sector, entitled “Elgoibar. Short history of machine tool”.